Pakistan Army successfully defended their title after defeating archrivals Pakistan WAPDA 71-45 in the final of the National Basketball Championship that concluded at the Sports Board Punjab Courts here on Monday. It was a hotly contested final between the two traditional rivals of national sports in which players of both teams amused the spectators amid their good putting, passing and scoring. Army exerted pressure on their opponents in the beginning of the first quarter through Rashid and Naimat who exchanged excellent passing between them and earned points for their team. In the second quarter, Army doubled their pressure through Atif and Farhad who skillfully carried the ball, putting it well and scoring precious points. Particularly Atif moved in every corner of the court with firm possession of the ball and scored valuable points for Army. Though WAPDA were trailing 25-45 at the end of the second quarter yet they demonstrated aggression in their game in the third quarter which electrified the crowd who cheered the players profusely. WAPDA's strategy worked as Army could score 12 points only. WAPDA also tried hard to narrow the deficit in the last quarter which they lost by one score yet the overall deficit was wide enough to cover. Atif (16), Tughlaq (15) were the top scorers from the Army. From WAPDA, Zahid and Abid scored 13 and 12 points respectively. 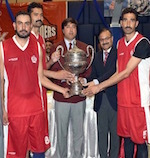 Earlier, in the first semifinal Army defeated Pakistan Ordnance Factory 92-55. In the hard fought second semifinal, WAPDA beat Lahore Division 66-61. For the third position match Lahore division defeated POF 66-59. Punjab Minister for Sports & Youth Affairs Jahangir Khanzada was the chief guest at the prize distribution ceremony. The Sports Board Punjab gave a cash prize of Rs.100, 000 to Army, Rs.75,000 to WAPDA and Rs.50, 000 to Lahore Division. University of Central Punjab (UCP) won the Pakistan Inter-varsity Men's Basketball Championship 2017 after defeating Punjab University 78-57 in the final here at Jahangir Khan Indoor Complex, Bahria University, Naval Complex, on Thursday. UCP was on top of the final right from the start and they never allowed PU to stand any chance of showing their game. UCP were leading by 8 baskets after the first quarter and they maintained 8 points lead in the second quarter. In the third quarter, they stretched their lead to 20 which was further enhanced to 21 in the fourth and last quarter. Zain of UCP was declared player of the final. UCP Director Sports Arsahd Sattar handed over Rs 12,000 cash to Zain, while Director Sports and team manager Hafiz M Aslam also lauded the UCP team. Pakistan's men and women basketball teams' participation in the Islamic Games is in jeopardy as Pakistan Sports Board (PSB) has removed the discipline from the list of the disciplines which the state will sponsor. A senior official of the Pakistan Olympic Association (POA) Khalid Mehmood told 'The News' from Lahore on Thursday that the Board had decided not to sponsor basketball teams which had been training for the last three months. Each team consists of four players and has one official. The teams are currently in Islamabad. They also trained on Thursday. Khalid said that they would request the Board to accommodate these teams. 'We will request the PSB to accommodate the two basketball teams. It will be a real loss to the players if they fail to proceed to Baku. Their accreditation cards have already been made,' Khalid said. He added that the Board had decided to sponsor a 189-member contingent. He added the POA would sponsor some of the contingent officials. He said that the total contingent strength might reach 215. Khalid said that the Board also does not back a ten-member zurkhaneh squad and it would be financed by its international federation. Pakistan Basketball Federation (PBF) secretary Khalid Bashir told this correspondent that he came to know only a few minutes ago about the matter and would write to the PSB on Friday (tomorrow). 'I don't know why the PSB is not backing our team. If the Board had any grievances why had it sent our teams to India last year for the South Asian Games? And if it was not in a position to send our teams to Baku why were we told to hold camps,' Khalid said. He said that the teams even practised at the Pakistan Sports Complex Islamabad on Thursday. Khalid said their top priority would be to convince the PSB. 'We will make our last-ditch effort and hopefully the state will sponsor our players,' Khalid said. He said the teams had prepared very well and the tour would help the players get much-needed international exposure. Last year Pakistan's basketball teams were unlucky not to take part in the South Asian Games in India in spite of the fact that the outfits had reached India for the purpose. A parallel basketball association in India had got a stay order against the competitions which left Pakistan's players utterly disappointed. The Green-shirts had entered international arena after years of wrangling at home between parallel bodies. A couple of months ago a senior official of the PSB told this correspondent that they had asked the PBBF to meet some legal and constitutional requirements but the federation had not yet bothered to reply. And the official did not seem happy with the federation which is recognised by the international basketball governing body (FIBA) and the POA. Brig (retd) Rashid Malik, a former Pakistan captain, serves as president of the PBBF. Meanwhile, it is highly likely that the accommodation fee would be transferred to the organisers of the Islamic Games on Friday (today). 'We are hopeful that the fund will be released tomorrow. We will try to transfer it either from the Board's account directly or we will make it online from the POA's account,' Khalid Mehmood said. He was quick to add that the departure schedule of Pakistan's handball team might be changed. 'The handball team was scheduled to fly out for Baku on Saturday. Now with the consultation of the president of Pakistan Handball Federation (PHF) we are trying to reschedule its departure and most probably the team will depart on May 8. They will start competing in the event from May 9 but I don't think their initial match will be tough,' Khalid said. He said that the POA would meet on Friday (today) with the officials of the federations in Lahore whose teams are set to depart for Baku. 'We will finalise contingent officials and discus some other matters in the meeting,' Khalid said. Pakistan will feature in 15 disciplines in the competitions.